The number of Bluetooth enabled devices in the world is expanding rapidly. From wireless headsets to fitness trackers to speaker docks. Everything electronic seems to have a Bluetooth connection as a feature. Advances in battery life and technologies such as the Bluetooth Low Energy standards have given rise to smaller more compact devices such as ultra-small lightweight headsets, Fitbits, etc. The big problem is that when things get smaller they can also get lost more easily. Who hasn't lost one or two Bluetooth headsets in the past year? When you set up a Bluetooth device, you usually pair it to another device. For instance, you’ll pair a headset to a phone or a phone to a car speakerphone / audio system. This pairing mechanism is critical to helping you find a lost Bluetooth device and we’ll show you how and why in a minute. 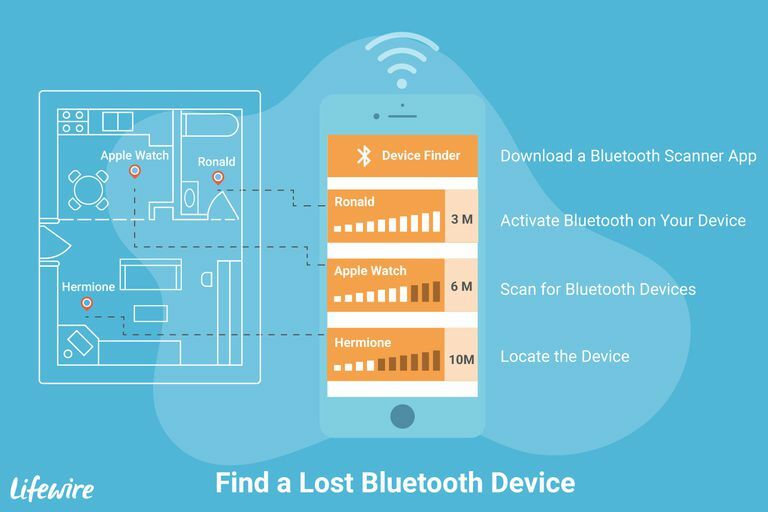 I’ve Lost My Bluetooth Device (Headset, Fitbit, etc)! Now What? As long as your headset or device still has some battery life and was turned on when you lost it, the odds are pretty good that you still will be able to find it with the assistance of a smartphone and a special app. In order to find your device, you’re going to need to download a Bluetooth scanning app. There are several of these apps available for both iOS as well as for Android-based Phones and Tablet from Google, Samsung, etc. Before you begin the hunt, you need the right tool. You should download and install a Bluetooth scanner app on your phone. The scanner app will show you a list of all the Bluetooth devices in the area that are broadcasting and should also show you one other important bit of information that will help you locate the device: signal strength. Bluetooth signal strength is usually measured in Decibel-milliwatts (dBm). The higher the number or the closer the negative number is to zero the better. For instance -1 dBm is a much stronger signal than -100 dBm. We won’t bore you with all the complicated math, just know that you want to see a number closer to zero or above it. There are several Bluetooth scanner apps that are available for various types of smartphones. If you have an iOS-based phone (or other Bluetooth enabled device, you may want to check out Bluetooth Smart Scanner by Ace Sensor. This free app can locate Bluetooth devices in the area (including low energy types (according to the app information page). There are other options, search “Bluetooth Scanner” to find more app choices. Android users may want to check out Bluetooth Finder on the Google Play App Store, It provides similar functionality as the iPhone App. A similar app for Windows-based phones is available as well. Your Bluetooth device won’t be able to be located if your phone’s Bluetooth radio is turned off. Make sure you turn Bluetooth on in your phone’s settings before using the Bluetooth locator apps downloaded in the previous step. If you’ve lost something such as a headset, you could also try to send some loud music to it via your phone’s music app. Since most Bluetooth headset’s volume can also be controlled by the phone, you could crank the volume all the way up. If the searching environment is fairly quiet, you might be able to locate it by listening for the music coming out of the earpieces on the headset.